Sometimes OS X works in mysterious ways. Take, for instance, the matter of user preferences. In some cases, we get full control over the many things one can do with an application. TextEdit has about 30 different things you can set in its preferences screen. Then, in other areas, we get next to no control. Want to choose a theme for OS X? You can use the Appearance System Preferences panel, but for seven years now, the only choices we’ve had are Blue and Graphite. Even worse, though, are those things we apparently have no control over—such as expanding archives. If you’re like me, the archive dance goes something like this: download file from the net, expand the archive, mount the disk image, drag the application to hard drive, eject the disk image, throw the disk image in trash, and throw archive in trash. (I keep some installers around for future use, but not most of them.) In OS X 10.4, there’s really not much you can do about this process—BOMArchiveHelper, the program that expands archives in OS X 10.4, is a faceless background application, lacking any sort of ability to change its behavior. At first glance, it seems things are the same in OS X 10.5, but that’s not the case. There are some very useful options here, especially in the expansion section. You can specify a folder to expand all archives into, and tell the system what to do with the archives after expansion. Not only can you have them moved to the trash, but if you prefer, you can have them completely deleted instead. I chose the move to trash option, as it seemed a bit safer. You have similar options when creating archives, and can even change what method of archive creation is used. If you’re going to change these prefs a lot, you can drag a copy of the application to your Dock or sidebar…or take advantage of a super-secret system preferences panel that Apple buried within the application. 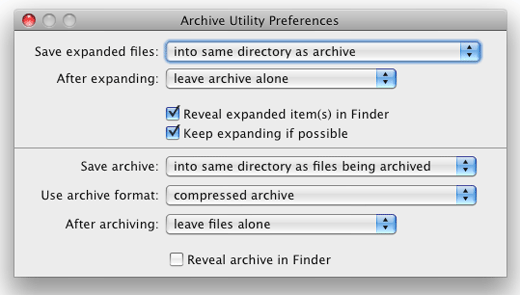 In the Finder, control-click on Archive Utility and choose Show Package Contents from the pop-up menu. Navigate into Contents -> Resources, and then double-click on Archives.prefpane. The system will then ask if you’d like this preferences panel installed for all users, or just your current user. Decide which you’d like, then click Install. Presto, now you’ve got a System Preferences panel available to change your archive settings, without the need to keep the program’s icon around for fast access. Note to technical users: the really slick way to activate the Archive Utility’s preferences panel is to create a symbolic link to the preferences panel, in case Apple updates this panel at some point in the future. I’ll leave that exercise to the reader; for folks like me who are more comfortable in the GUI, it’s easy enough to remove the panel (just control-click on it in System Preferences) and reinstall it in the future if you want to check if it’s been updated.